I love birthdays. Not mine but everyone else’s are always lots of fun. May kicks off birthday ‘season’ for us and this year a Star Wars party was requested. 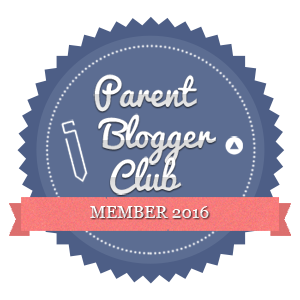 If you are a regular reader of the blog you might have read about some of the planning around the Star Wars party. At the point of writing that I hadn’t really thought through the food in any detail. 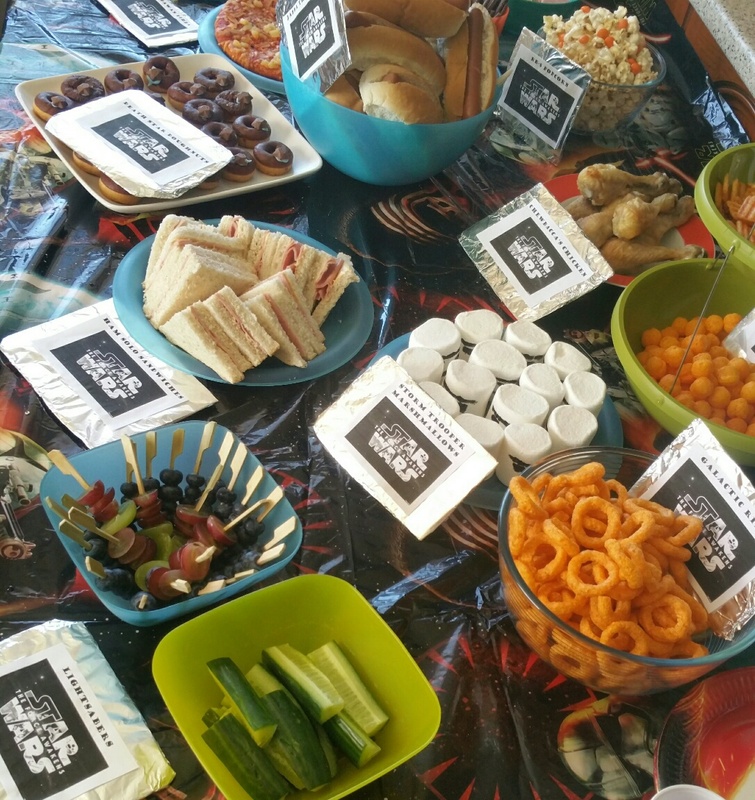 I managed to keep the fact that I was going to theme the food around Star Wars a secret until the day of the party and fortunately that went down quite well. 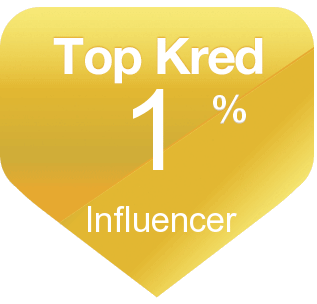 I made food labels by typing up little signs and then wrapping tin foil around bits of cardboard and then just stuck the labels onto the tin foil. Some of the party food was regular party food with Star Wars names just to keep in with the theme. So for example, we had “Jabba the Hot Dog” which were just regular hot dogs and “Thermal Detonators” which were cheese balls. “Galactic Rings” were onion rings and “Chewbacca’s Chicken” was just regular chicken drumsticks. 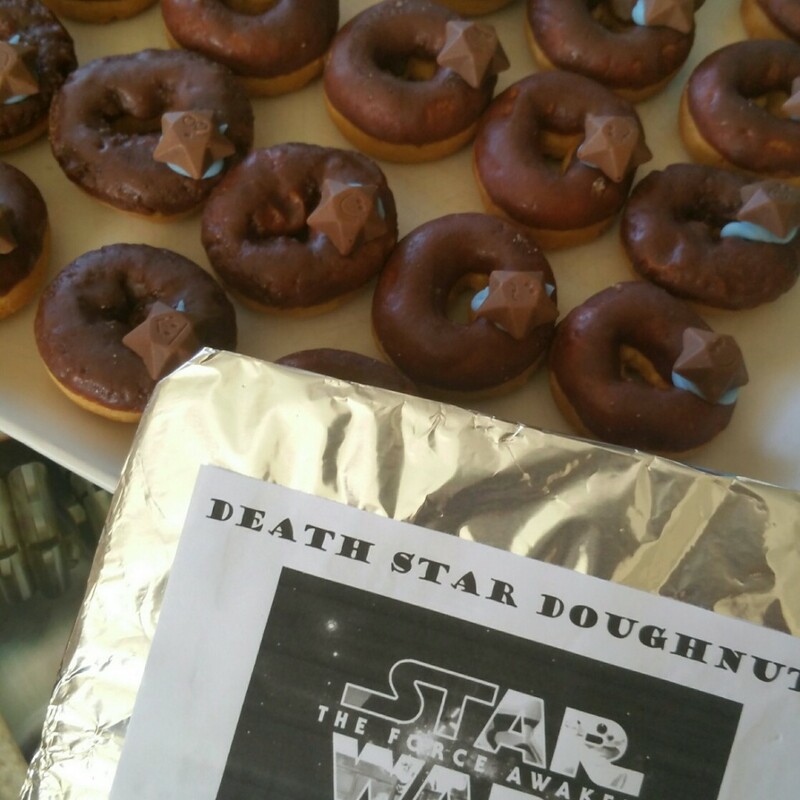 Other items were a bit more Star Wars related, like Lightsaber fruit skewers and our “Death Star Doughnuts”, which were mini chocolate doughnuts with a magic star attached to each one with blue icing. 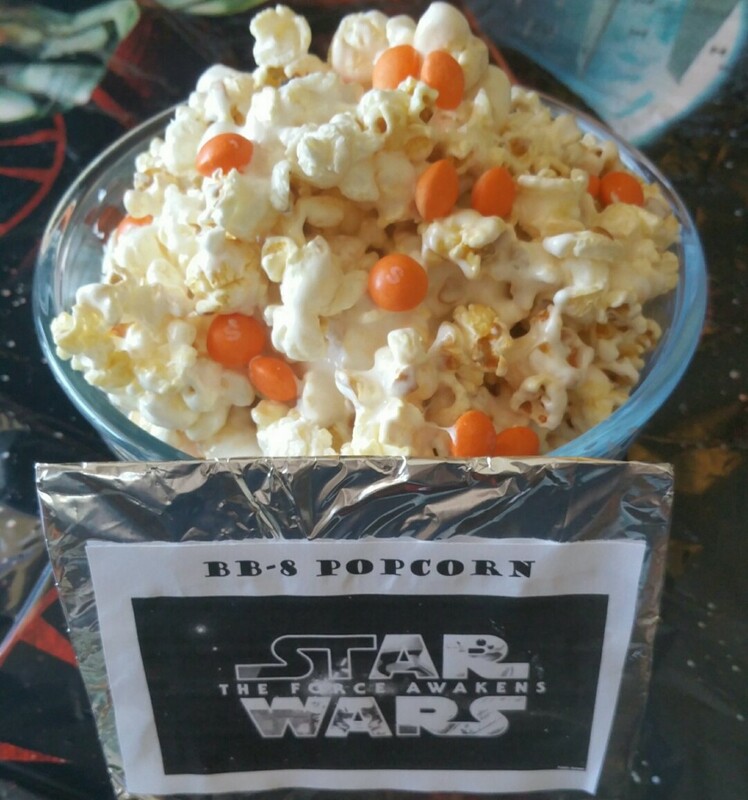 We also had things like “BB-8 Popcorn”, which involved melting marshmallows in the microwave with a splash of milk, mixing in popcorn and sprinkling with orange skittles. 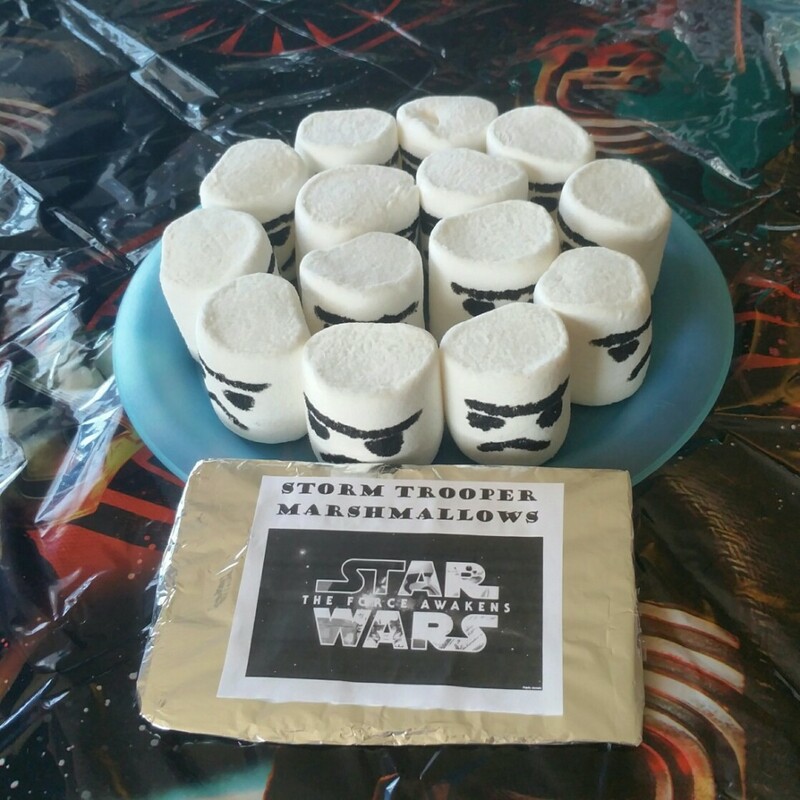 Using an edible ink pen I did my best to draw Storm Trooper faces on giant marshmallows. I guess you could use regular size marshmallows but I think these big American ones work the best. We also had things like “Jedi Juice” which was just strawberry Ribena, “Padawan Pizza”, “Ewok Treats” and “Dark Side Vs Light Side” which was a mix of milk and white coated chocolate eggs. The force was certainly strong! 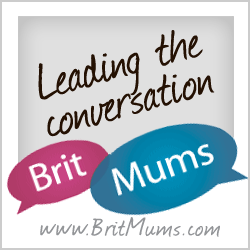 What a great idea – adding a whole new dimension to a ham sandwich or a hot dog !